October 8th I woke up knowing it was the day!! The day I have been waiting for since I heard my first Avenged Sevenfold song in 2006!! It was the day of my first Avenged Sevenfold concert!! All day I was nervous, sick to my stomach really. I listened to every Cd I have all day waiting for 3pm when I would head to Baltimore md. I took hours to decide what I would wear with the Avenged Sevenfold shirt I recreated the night before. Finally, it was time to get ready. I took a shower, of course, listening the the self titled album. I did my makeup listening to Waking the Fallen. And got dressed listening to Hail to the King. Still nervous and sick to the stomach I made sure I had my two 'together VIP' tickets, gps, and keys. Then I walked out the door shaking thinking "I'm going to see their faces in person!". I headed down to pick up my friend, Tony, who has seen avenged sevenfold multiple times. The whole hour and 40 minutes to Baltimore, we talked about how excited we were, and what we did all day getting ready for this concert. Listening to the radio talk about how the pyrotechnics and lighting were the best they've done so far and how this is going to be a night to remember, both of us, nervous and ready to get there. Finally, we hit Baltimore!! Nothing like I've ever seen it we parked in a parking garage just blocks away and followed a group of guys headed in the same direction. (They looked like they knew where they were going). A block and a half away from the Arena we saw the lights and the radio station van. I jumped for joy. Only hours stood between me and Avenged Sevenfold!! We walked to the doors, tickets checked, wristbands on, and straight into the arena! I was holding Tony's hand shaking of excitement. I go up as close to the stage as I can get. Waiting...waiting...then finally Ghost hits the stage!!! I've never ever heard of them. They can out in the long trench coats. I was taken aback. Confused a bit. At first I was not into them, until I figured out that they are from Sweden. It all made sense. I was really into their style. Next was Deftones!!! I am a fan of Deftones!! They make great music. And I was so excited to have the chance to see them! Rocking out to Deftones. In between their songs we decided to follow a group of kids in Burger King crowns closer. It was a great idea...until they stopped in the middle of a huge crowd of people that were already packed together. Well, we stopped and the guy behind us wasn't happy about a tall guy stopping right in front of his girlfriend...a few shoves were exchanged but we got settled. The last song from Deftones came on, people were crowd surfing like crazy, mosh pits on either side of us. It was so insane! When they left the stage it took FOREVER for A7X to come on. The crowd chanted "SEVENFOLD SEVENFOLD SEVENFOLD!!!" And finally, the moment I have been waiting for. Since 2006!!! The curtains started to open! I'm on my tippy toes camera up in the air waiting. And there...there they were. Right in front of my face. In person. My mouth dropped. They started playing Shepherd Of Fire. Screams came from everywhere!!! The crowd pushed forward. 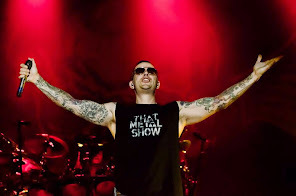 Matt asked the crowd who's first A7X concert it was. I screamed as loud as I could (probably hurt the guys ear that was in front of me). They dedicated Welcome to the Family to everyone there for the first time. I started video taping the song. But I was being pushed and shoved every which way it was pretty much impossible. I laid my head on the guy in front of me. Sweat dripping off of my face. Singing along to every word of of the next 2 songs. Still holding onto Tony making sure not to loose him in the intense moshing crowd. Finally I turned to Tony trying to catch my breath from being pushed, shoved, crushed, and hit from all of the crowd. We decided we could move back a bit now so I could enjoy the rest of the show pushing and shoving free!!! With each and every song that started we stood, staring at the stage, singing along, rocking out to the music, capturing video after video, picture after picture. And then, Synyster was ready for his moment, his solo. Tony and I both in awe of how fast he was going. Then Arin jumps in...I just couldn't get enough!!! But on to the next song!!! The pyrotechnics and lighting were so crazy, unlike anything I've ever seen before (just like the radio announcer said)!!! Then suddenly, Matt picked on guy from the audience up on stage. He had a giant deathbat tattoo across his chest. Matt, Syn, Zacky, Johnny, and Arin all signed his chest! I must admit I was jealous!!! All night I was still in shock... Thinking "I'm watching Avenged Sevenfold LIVE AND IN PERSON!!" It was honestly a dream come true. And sadly all dreams must come to an end. The last song came on...and ended...like that. The whole entire crowd shouted "ENCORE ENCORE!!!!" And patiently waited. Curtains closed. And then you hear Shadows say "you guys want more?!?!" And the crowd kroared with excitement. And of course we got the encore!! We walked out of the Arena in utter and pure craziness. We got to the car and sat...just sat. And the whoooole ride home, we said "that was so intense/crazy/unforgettable!!!" This is DEFINATLY a night I will NEVER forget!! So thank you M. Shadows, Synyster Gates, Zacky Vengeance, Johnny Christ, and Arin Ilejay for a night to remember and the best first Avenged Sevenfold concert anyone could ask for!! !